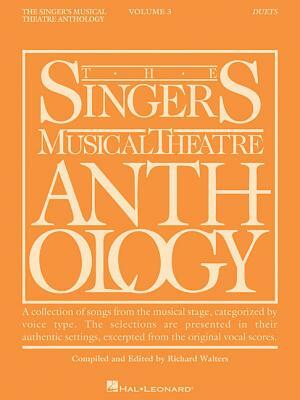 Singer's Musical Theatre Anthology Duets Volume 3: Book Only (Paperback) | The Drama Book Shop, Inc.
(Vocal Collection). The world's most trusted source for great theatre literature for singing actors. The CDs include piano accompaniments. The book features authentic editions of each duet in the original keys. The duets have been carefully chosen and are culled from a wide selection of classics and contemporary shows. Contents: THE ADDAMS FAMILY: Crazier Than You * AVENUE Q: Schadenfreude * CABARET: Money, Money * CANDIDE: Oh, Happy We * CHILDREN OF EDEN: In Whatever Time We Have * A CHORUS LINE: Sing * FIDDLER ON THE ROOF: Do You Love Me? * THE FROGS: Invocation and Instructions to the Audience * GODSPELL: All for the Best * GREY GARDENS: Peas in a Pod * INTO THE WOODS: Agony, It Takes Two, No More * THE LIFE: My Friend * THE LIGHT IN THE PIAZZA: Statues and Stories, Say It Somehow * THE LION KING: Can You Feel the Love Tonight * A LITTLE NIGHT MUSIC: Every Day a Little Death * MONTY PYTHON'S SPAMALOT: I'm All Alone * MYTHS AND HYMNS: Come to Jesus * PARADE: All the Wasted Time * THE PRODUCERS: Where Did We Go Right? * THE RINK: The Apple Doesn't Fall Very Far from the Tree * SPRING AWAKENING: The Word of Your Body * SUNDAY IN THE PARK WITH GEORGE: Move On * SWEENEY TODD: Kiss Me * WEST SIDE STORY: A Boy Like That/I Have a Love * WICKED: As Long as You're Mine, For Good * WOMAN OF THE YEAR: The Grass is Always Greener.